Dree Hemingway stars in Starlet, from the makers of Greg the Bunny. Documentarian Debbie Lum is part of the story in Seeking Asian Female. In Search of Blind Joe Death: The Saga of John Fahey – John Fahey is one of those musicians for whom the word “seminal” seems to have been invented. Known for his “American primitive” approach – i.e., self-taught – the guitarist is a musician’s musician who, after years of obscurity, experienced a resurgence in the ’90s as alternative rock bands like Sonic Youth started dropping his name. He died in 2001, at 61; James Cullingham‘s hour-long documentary explores his legacy, with contemporary interviews and archival clips. A must-see for those who know the name but know very little about the man himself (i.e. this reviewer). 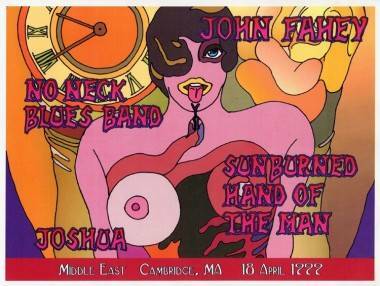 John Fahey poster circa 1999. Starlet – Painfully indie – i.e., it looks as though it was edited by a monkey with ADD – Starlet is nevertheless an entertaining slice-of-sunburned life in San Fernando Valley. The making-it-up-as-we-go-along feel is belied by a smart script that offers something in just about every scene – a nuanced character reveal, a clever line – although you may find just about every one of the characters unlikable, and the main storyline – about a girl who befriends an unpleasant older woman – a might farfetched. Starlet doesn’t so much as try to find their human side as it does sit back and let themselves pole-dance themselves into oblivion. It stars Dree Hemingway, yet another offspring from that famous clan, and is written and directed by the creators of the TV series Greg the Bunny (which, in one scene, a character is seen watching). For more info go to the Vancouver International Film Festival website. This entry was posted in reviews, the latest and tagged movie reviews, Vancouver International Film Festival. Bookmark the permalink.